“Journal Survey,” Journal of Sport History, Fall 1997–. “The 1932 Beaumont Exporters,” presentation given at the Beaumont History Conference, Beaumont, TX, Jan. 14, 1995. “Zeke Bonura,” presentation given at the SABR Hall-Ruggles Chapter meeting, June 3, 1993. Ventura Publisher, the Formative Years, 1986–1991: An Annotated Bibliography, 1992. “Genesis of the Bicycle in the United States, 1865–1893: A Bibliographic Tool for Researchers,” master’s thesis in American social history, Emporia (Kansas) State University, December 1982. “History of the Bicycle” — 30-minute historical documentary for a Kansas PBS station in 1982. “Bikes and books, bicycle books reviewed,” column syndicated internationally, 1977–1982. “bicyclio, a bicycle history column,” column syndicated internationally, 1978–1981. “A History of the Bicycle,” presentation given at the Kansas Bicycle Dealers Association, Emporia, Kansas, Summer 1980. Larry is working on La Tribuna Italiana: 50 Years of Italian-American Expression, a history of the Italian American newspaper in Dallas. Larry has used his knowledge of GIS to create history-oriented analysis projects. 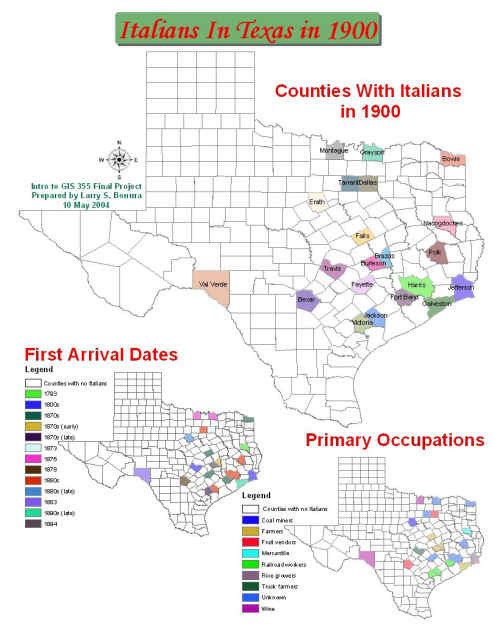 Here’s a project showing Italians in Texas in 1900, a look at the counties who had Italian immigrants in 1900, when they arrived in those counties, what their primary occupations were, and where they came from in Italy.